Coming off my NASCAR post, I thought this would be a perfect time to post a quick spotlight of a car I came across at the Mopar Spring Fling show in Van Nuys. 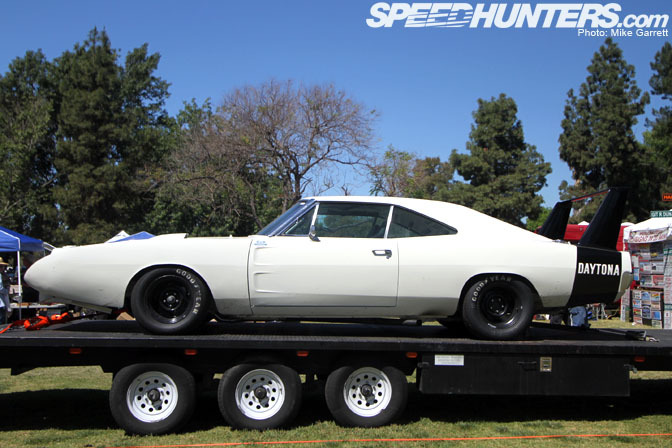 From across the grass the shape of this '69 Dodge Charger Daytona was unmistakable, and I quickly found myself heading right toward this piece of Mopar history. It was just sitting on a trailer, no one around it, no for sale sign. Nothing. All I know about it is what I saw. There's a possibility it may have even been a replica, but it certainly looked legit to me. This one looked like it had a competition background to it. You can see the side pipes dumping in front of the rear tires there. 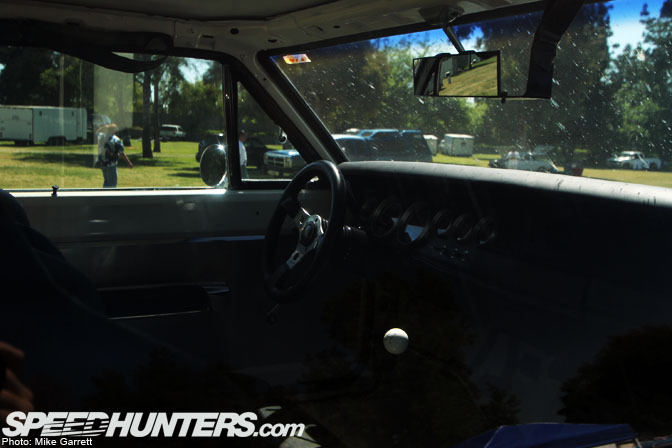 A peek inside revealed a pair of bucket seats, racing gauges and mean looking shift lever. 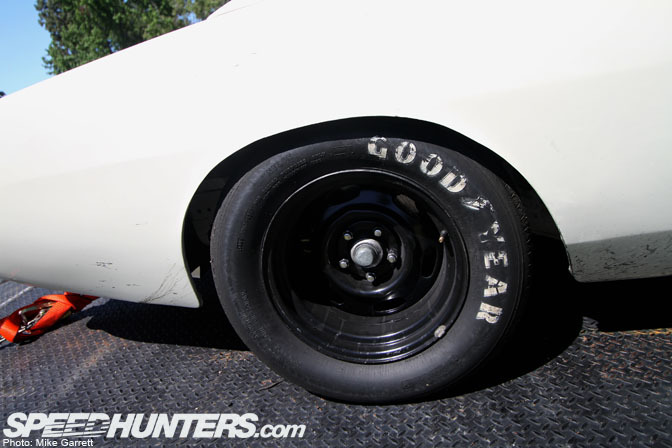 The wheels were widened Mopar "cop wheels" with fat Goodyear tires, filling out the fenders nicely. Whatever it was, it certainly wasn't a show car. It had a very mean, functional look to it, and that was the reason I was drawn to it. Maybe there's a chance it will pop up sometime and one of the vintage race events here in California. How cool would that be? 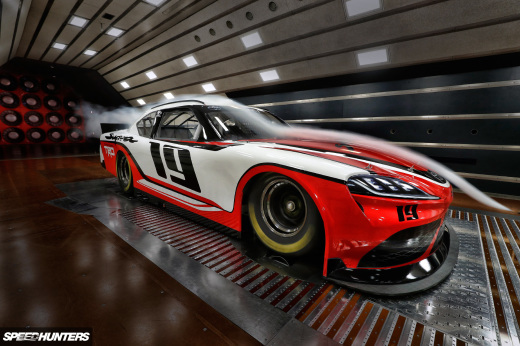 Love the straight race car look going on here. First car back in the day to do 200 mph! One of my favorite cars. That thing looks mean as hell. I completely agree with hushypushy. I would love to hear whether this is a replica or the real deal. 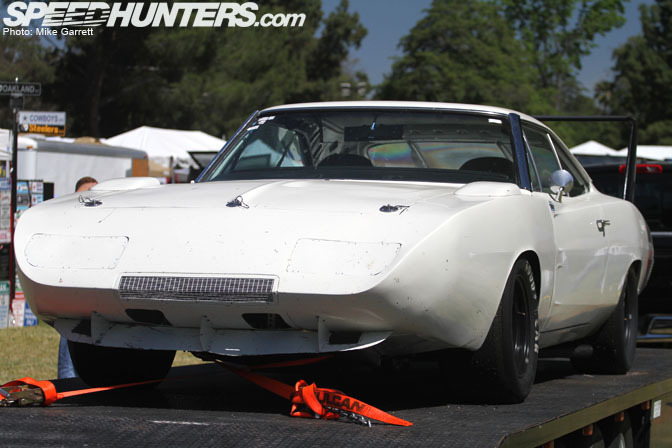 A Daytona/Superbird holds the production coupe record at Bonneville at like 245MPH. This one has a great road race/tough look to it. Love those wide front meats! Wish we had an engine bay shot. it looks pretty convincing even if it is a replica, a photo of the engine may have helped to answer a few more questions.. i think we should all keep our eyes peeled to see if it pops up anywhere else!! - thanks for the insight tho'. - an absolute flying machine! Pretty hopless you couldn't find more out about it. No roll bar or roll cage. But the rear bumper fairings say "circle track racer". Those fairings are so the cars don't hook each other when they "rub". So I don't really get what it is. I've never seen that one piece front nose section, normally its like a regular charger rectangular front end, with the slanted "nose" piece bolted on...this looks like its all one big front end. I'm def interested in finding out some more if possible. beautiful. love the functional look to it. I was never a fan of the Daytona, but this one has an unspeakable aura surround it that makes me like it! Among other things it has lexan windows n has obviously turned a wheel in anger from the gum on the rear fenders don't care if its a replica. this thing is beautifuly mean.. replica or not that thing would be so fun to take to a track!! I hate it when car owners use such a weak wheel offset............. HAHA, car looks good. I bet it's worth a fortune. always loved this car as a kid and still do.. best wing ever!! One of the greatest cars of all time. 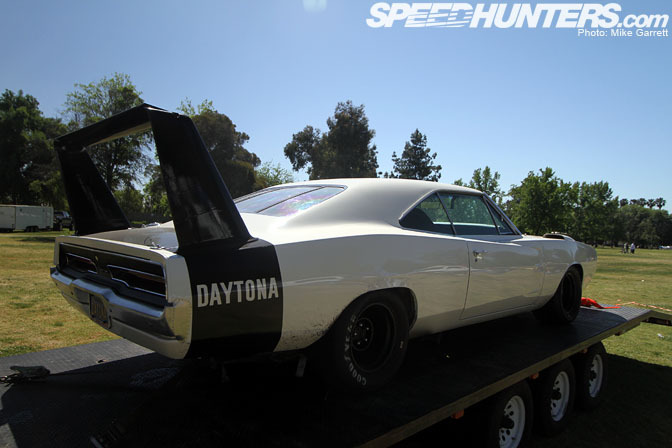 It could be an original Daytona, but it doesnt look like the doors were ever welded shut, and it looks like the glass and window risers are still intact. It doesnt look like it was a Grand National Car back in the day. The fuel fill could have been returned from the side of the fender for fuel cell to the top of the fender, and restoring the tail lights would have been one of the easier changes. 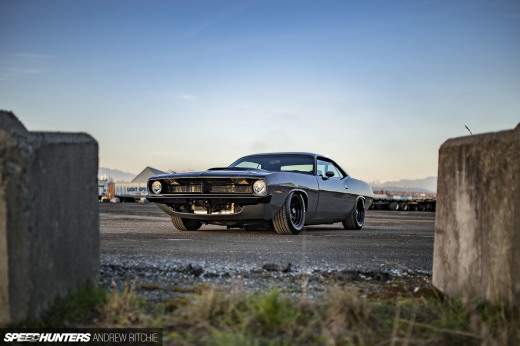 But it could have had a quarter mile or Bonneville back ground. Who knows how many times that car has been built and rebuilt since it left the show room back in 69. I agree with JMango. Street versions never had that one piece fender/nose cone. Guard: Don't try to church it up, son. Don't you mean "Joe Dirt"? Naming you that, your daddy must've really hated you. Guard: I have a good name for this car... "Rusty". Guard: Don't bother, just drive this piece of crap off a cliff. Do us all a favor. 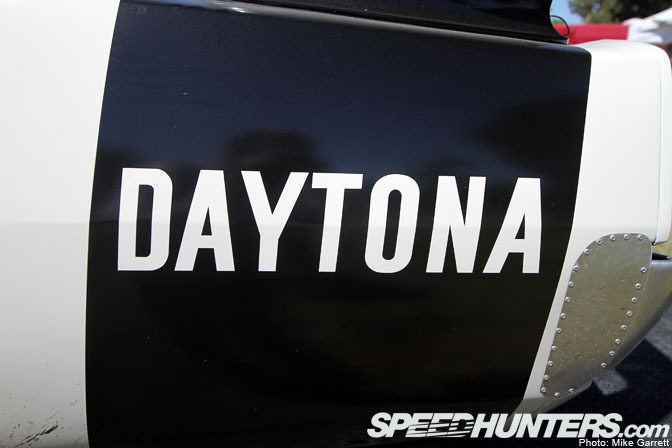 Not entirely sure this is the real deal, as far as I know, these NASCAR-spec Daytonas were built with a cage. I do not see one in this car.